A while ago we finished the digital restoration project „Les Equilibristes Godayou“. The project was done by Raoul Schmidt, Matteo Lepore and myself for the Austrian filmmuseum ( www.filmmuseum.at ). 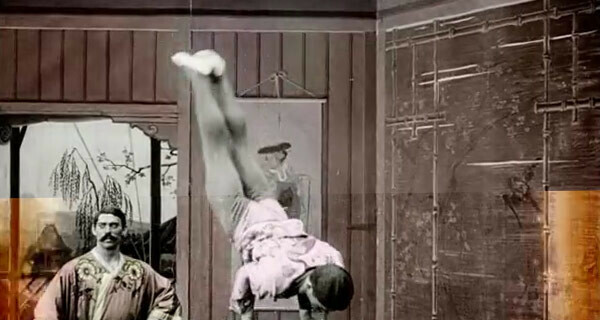 It has been made from 1911, a french Pathé production, showing two members of a japanese circus doing their performances. Remarkably it´s a stencil colored film, where black and white material has been colored with special Pathé colors. The material was i relativly bad condition: water damage, scratches, dust were quite visible, singular images were almost destroyed to a full degree. As it was one of our first restoration projects we tried to keep a high standard, scanning in 4k, we used the diamant software from www.hs-art.at for deflickering, stabilizing, automatic and manual dustbusting, a lot of things have been done manually. It was crucial to not use aggressive filtering, because this could lead to unwanted artefacts.